My head could spontaneous explode at any moment, so if this blog stops randomly in the middle of a sentence, someone call my parents. 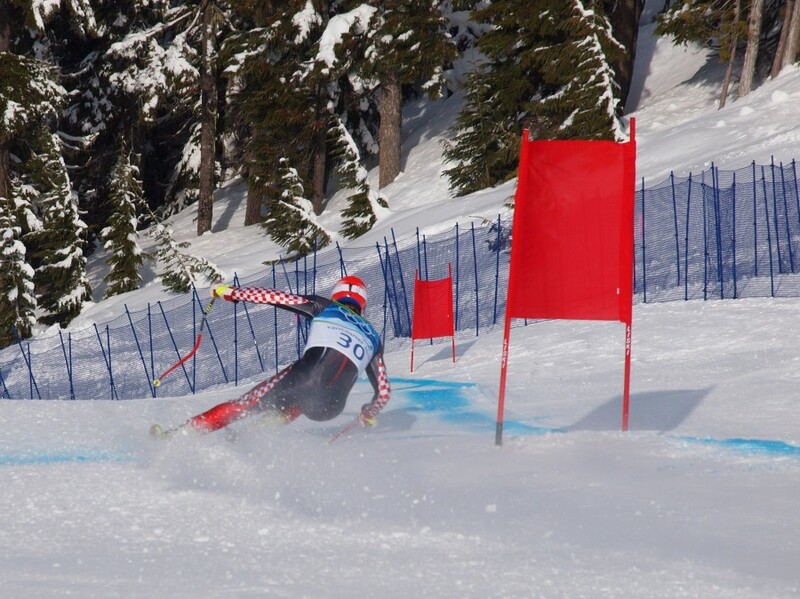 The showcase event of any Olympics is the men’s downhill skiing competition. This one is no different. When I was looking at tickets before I came, this was the event I first looked for. I found them to be astronomically priced, and I then came to terms that I wouldn’t make it. When I learned there were public viewing areas along the course, I had to go. I had to ride two different lifts to get to the top of the course, and just as I skied off the second, the sky opened up as if Mother Nature knew the Olympic showpiece was soon to be on display (she’s been a cranky-old broad, otherwise). I started at the top, weaseling my way to a spot along the fence to take in the race. It turned out to be a great spot. When you attend events like this, you usually only see a fraction of the course and the racers for the milliseconds as they fly by you. From this spot, I saw the start and the next eight gates down the course, so I lucked out. These viewing pods didn’t have anything more than a fence surrounding it and several volunteers staffing it. There wasn’t a scoreboard, racer lineups, or even speakers to listen to the finishes (the lowest of the pods had speakers, but that’s it). So for me, besides seeing a portion of each run, and knowing that it may be the run that is talked about for years, it was fairly uneventful. The crowds hovering around with different country flags would cheer as their racers went by. 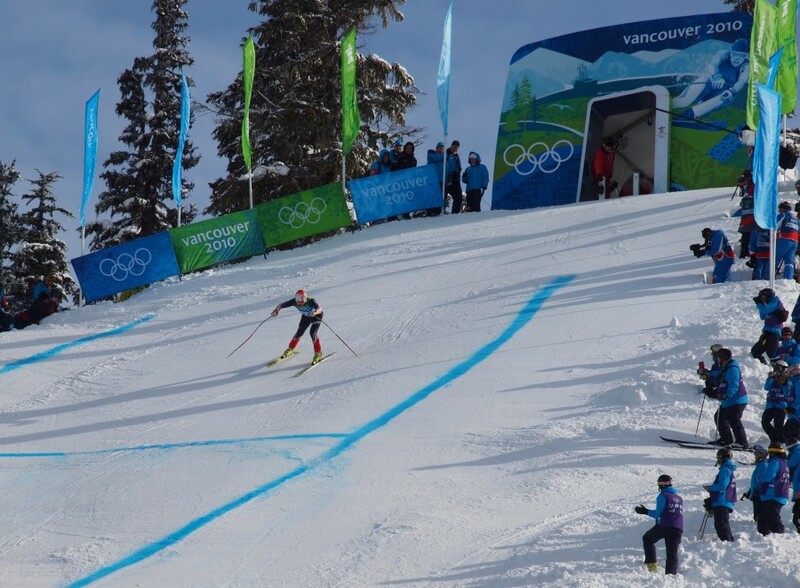 I, a fan of Bode Miller, gave a whoop as he took off from the starting chute (P.S. Bode’s back- finished with a bronze) along with all the other star and striped fans. To counteract this lack of anything race-related, several people that brought their technology up to the mountain would holler out the lineups and results after a few button pushes or calls to friends. The impromptu announcers with their boisterous deliveries and different accents were, though not only helpful, at least a pretty cool memory. Being a skier, I was interested to see what it was like seeing the best skiers in the world in person. After experiencing the luge in person, I figured the skiers’ speed would amaze me. It did, and proves to me I’m a chump when it comes to skiing. The one surprise to me was how quickly they reached that speed. Since I was at the starting gate, this was fairly easy to see: within thirty feet of the chute these guys were already traveling at colossally high speeds. Gravity is pretty cool. The reason for my current condition is the nightly party that takes place at the base of Whistler Mountain called Fire & Ice. This is a celebration that is normally only once a week, but this being the Olympics, it’s been happening every night. 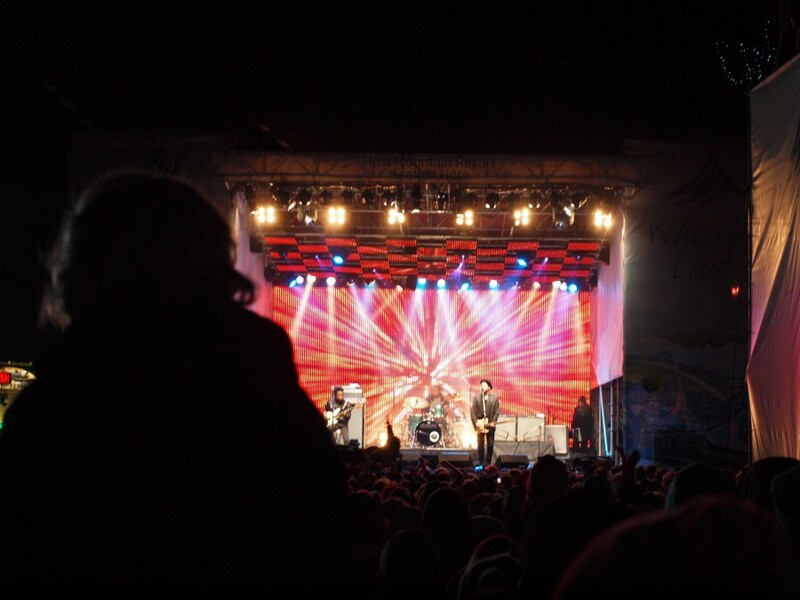 Live music is played while skiers and snowboarders throw a barrage of tricks through and over three flaming rings. What people do for entertainment, right? I headed over for the start of the hip-hop group Swollen Members (that’s their actual name, I can’t make this stuff up), that took the stage before the flames were lit. Fireball whiskey in hand (had to keep with the theme), the beats were loud, the energy was high, and the tricks were big. Towards the end of the show, the rappers commented on being hot, so what’s the only logical way to help out? Snowballs. It was absolutely hilarious; snowballs started flying from every direction, some towards the stage, most in no particular direction at all. Both Swollen Members ended up dodging projectiles for the rest of the show, while one lucky toss hit the mixing table and stopped the song. So, I sit here, watching the ladies snowboard debauchery on T.V. (literally everyone is flailing around the course), and preparing for the few remaining days ahead of me: a cross country sprint race, ladies super combined (weather permitting), and, yes, skeleton, followed by another circuit through Vancouver on my way out of town. For now, though, the rain is again coming down on Whistler, and it looks like I’m not going anywhere, anytime soon. I blame the Olympic revelry.